Look, no hands! Volvo's autonomous cars are coming soon. Are self-driving cars for real? Or just a shallow distraction, a kind of Hollywood-style robo-chic? If our recent trip to a test facility near Gothenburg, Sweden courtesy of Volvo is anything to go, it's very serious stuff. In fact, it's a big part of the solution to road safety. And it's central to Volvo's aim to reduce fatalities to zero by 2020. That's right, Volvo's ambition is to ensure nobody is killed or even seriously injured in its cars. And the plan is to produce cars that can achieve that aim by 2020. To achieve that, Volvo is developing a plethora of new technologies, many of which fall into the self-driving category. And we've driven prototypes featuring all of them. Or not driven them, if you see what we mean. Either way, perhaps the most impressive part of all this is that these new safety features are very much for real. All but one of the new systems will be available on Volvos you can buy by then end of 2014. Some of the new kit is an incremental step over existing technology, such as the pedestrian detection and collision avoidance system. Volvo's demo involved a dark tunnel and a spooky mannequin. But the really weird bit in forcing yourself not to brake as you approach the humanoid figure. Every cell in your body is screaming "brakes". But the system works, entirely avoiding an impact. Similar systems are already available in other vehicles but Volvo says its new take adds pedestrian detection at night to the mix, a capability that's claimed to be a world first. Then there's the road edge and barrier detection system that senses when the driver is drifting off the road surface or towards a barrier and gently steers away from danger. 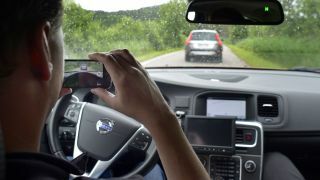 That doesn't sound all that dramatic, but Volvo reckons roughly half of all traffic-related fatalities involve cars departing the road in some form. But of all the automated driving technologies, it's got to be the Adaptive Cruise Control with steer assist that's most impressive. We've experienced quite a few smart cruise control systems before. Several manufactures offer solutions that can adjust speed to the car in front. Some can even do so right down to a complete stop. But Volvo's is the first that can also steer the car. The system's final capabilities are still being finalised, including the top speed at which it will operate. But the general idea is that it functions in heavy stop-start traffic rather than being designed to take over driving when you're cruising in free-flowing traffic at motorway speeds. Anyway, the system seems to work flawlessly and is a major step up from existing cruise control systems in terms of taking the effort and stress out of driving. There's only one snag and that's a requirement in the final version that will appear in Volvos next year to have your hands on the steering wheel at all times. It sounds like a minor detail, but the prototype system allowed you to completely release the steering wheel. It's an incredibly liberating experience. The reason for the hands-on requirement, of course, is that fundamentally this technology does not make the car fully autonomous. It only works in a relatively limited set of conditions and the driver needs to be ready to take over immediately. That said, we reckon it will make for much safer cars. Unlike dozy humans, the system never nods off, sends texts to its friends or rear-ends the car in front as it fumbles for snacks in the centre console. Volvo's final autonomous car technology is auto-parking. This isn't a system that helps you steer into a bay. You entirely exit the vehicle and command it to park via a smartphone app. And it goes off on its own and does its robo-thing.